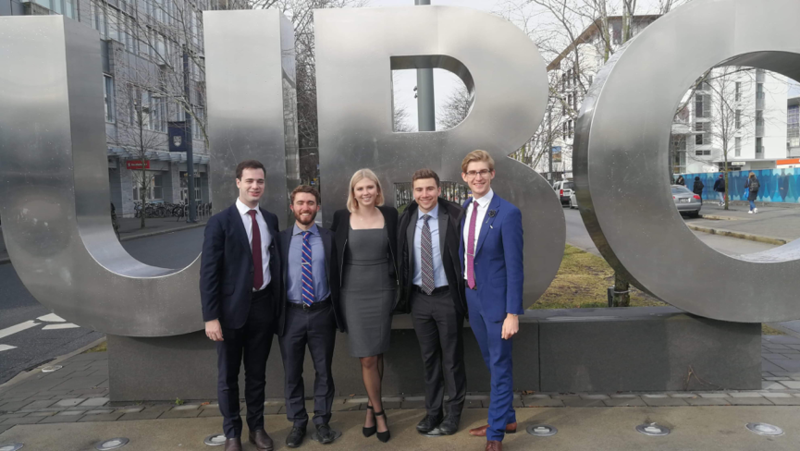 On Friday 8 March, Cam Edwards, Heath Gabbett, Michael O’Shea, our advisor Ingrid Larkin, and I boarded the 14-hour flight to Vancouver, Canada. 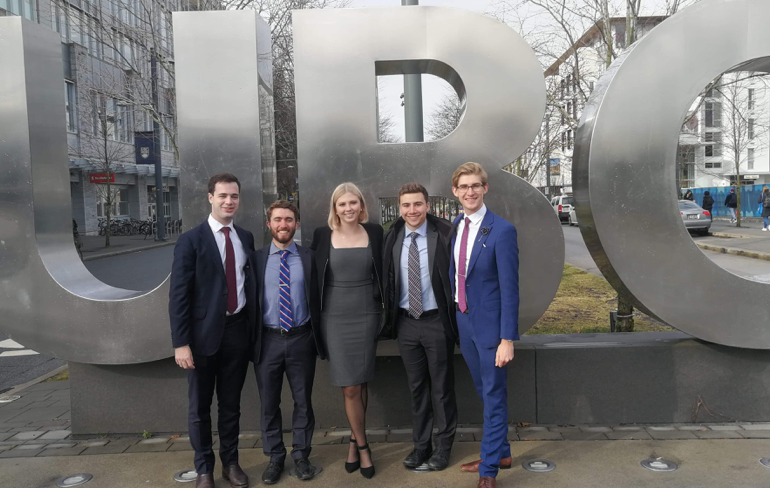 We were set to compete in the Sauder Summit Global Case Competition hosted by the Sauder Business School at the University of British Colombia. We were greeted at the airport by our International Ambassadors, Zach and Bella, who were our excellent tour guides and local friends for the week. Much to our delight, Vancouver did not present the dreary, rainy weather it is known for at this time of year. The sunshine must have followed us from Brisbane, as the temperatures hovered around 10 degrees for the week, and the cloudless skies made for a spectacular backdrop to the mountains surrounding the city. As a team, we had some time before and after the competition to explore Vancouver and its surrounds; from tandem biking around the Seawall at Stanley Park to crossing the suspension bridge at Capilano Park, exploring Granville Island, and hiking around Deep Cove – we certainly made the most of our travels. The official part of the competition commenced on Sunday evening, with the divisions being drawn. The competition had increased in size this year, with 16 universities competing from renowned business schools across the globe. QUT was drawn in division D, presenting fourth. We were up against the University of North Carolina, University of Washington, and Singapore Management University. The first case on Monday was a five-hour case with no internet access permitted. The case company was WOW 1 Day Painting, a franchise owned by Vancouver company, O2E brands. WOW 1 Day Painting wanted a strategy to grow its revenue by attracting more franchisees. To do this, we were asked to review the current franchise royalty model and adapt it to become more accessible and attractive to potential franchisees. QUT recommended our strategy, Support to Grow, which was a two-year support program aimed at supporting new franchises with both financial and in-kind benefits to dispel many concerns regarding the initial investment and ensure their success beyond the two-year mark. The impact of our strategy was to gain over 75 new franchises and achieve an NPV of $6.05 million. While Team QUT won the favour of one of the judges, we ultimately did not win the room, coming third in our pool. Despite this, we were proud of our efforts and looked forward to tomorrow’s case. For case 2, another five-hour case with no internet access, QUT was again in division D, this time presenting first. 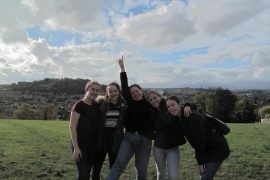 We were up against Copenhagen Business School, Universidad Panamericana, and Maastricht University. The case company, Animikii, is a digital agency offering website design, custom software, branding and digital communications for Indigenous and Indigenous-focussed companies, with the aim of harnessing technology as an economic driver towards Indigenous self-sufficiency. Animikii wanted to double its workforce in two years and triple its revenue in three years. 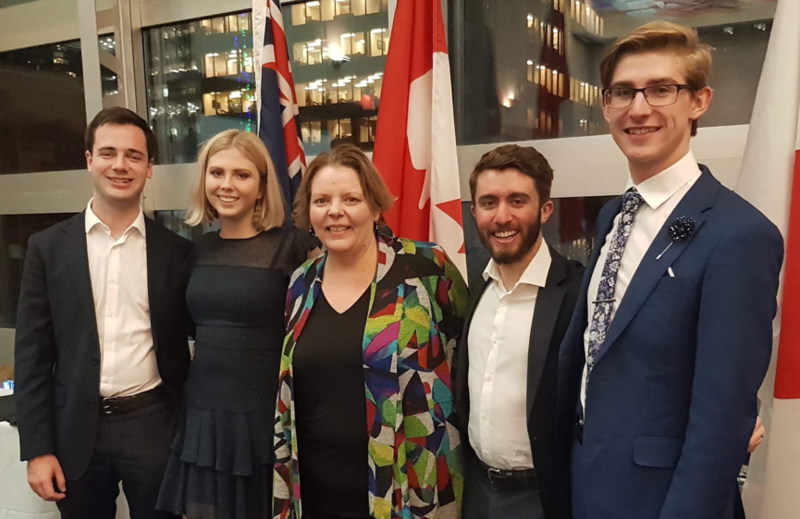 QUT presented our strategy, Expanding Impact, of expanding across the Canadian provinces to those with highest Indigenous populations, hiring Indigenous interns, and expanding Animikii’s data service by offering in-house data analytics. This would increase Animikii’s impact to broader Canada, with 50% revenue coming from non-British Colombian clients, as well as increasing its impact through empowering Indigenous clients through data ownership and analytics. This increased impact was reflected in an NPV of $750K. 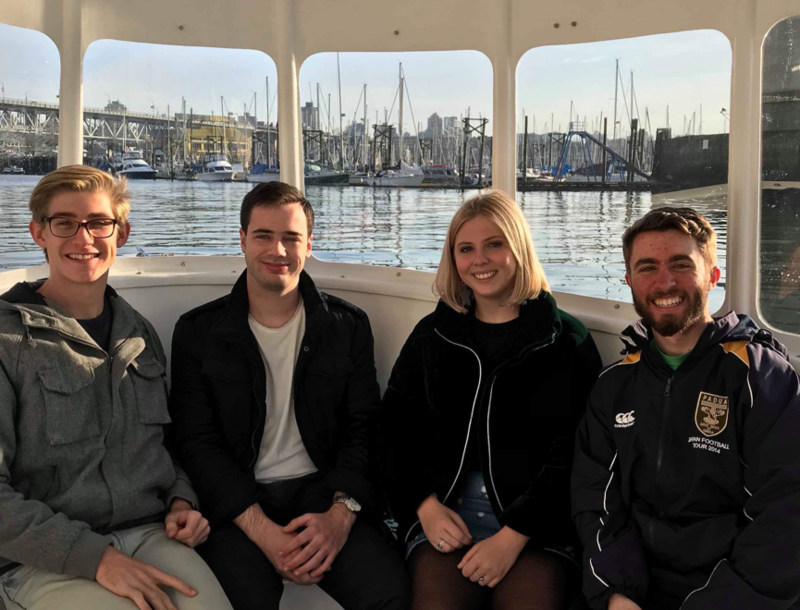 QUT placed second in the room, ranking us equal eighth place overall and placing us in a division with the National University of Singapore, Hong Kong University of Science and Technology, and the University of Washington for the 24-hour case. After an intense two days, Tuesday night was social night, and we all enjoyed getting to know the other competitors better and experiencing the Vancouver nightlife. With the knowledge that we would be spending the next 24 hours in our hotel room, we spent our free day on Wednesday exploring Granville Island, preparing for the case and getting some much-needed rest. The final case was upon us: we attended the 7.30am industry lecture and discovered the case company, Wenco. Wenco is a Canadian technology company that develops, manufactures and distributes computer systems and software to manage and control mining equipment. The case was long and detailed, asking several questions to be answered by our strategy. Faced with the volatility of the mining industry, Wenco was seeking a strategy that would capitalise on the current growth of the industry to reach $100 million in revenue by 2022. Wenco wanted to know which clients and mines to target, and how to do so. At the same time, Wenco was seeking to diversify its revenue streams either through expanding along the supply chain or by expanding beyond the mining industry. Our job was to decide which industry to expand into, and how to target prospective clients. Finally, with such a bold growth target, it was clear that Wenco could only achieve its $100 million revenue target within the three-year timeframe through an aggressive growth strategy involving acquisition. After a gruelling 24 hours, the team was proud of our strategy and we were ready to present. Our strategy focused on the need to leverage Wenco’s core competencies for fast growth, as well as the need to diversify revenue streams, which currently relied on a small cluster of large clients. We identified several untapped markets, including smaller mines in the ‘tier two mine market’ as well as the construction industry. As such, Team QUT recommended Wenco penetrate the tier two mine market by partnering with its parent company, Hitachi, and offering its predictive maintenance software, ReadyLine, on a SaaS model. Additionally, Wenco should acquire a construction software company to enter the construction market with ReadyLine. This strategy would result in $104 million in revenue by 2022 and would diversify Wenco’s revenue streams so it is less reliant on the mining industry. Despite our limited sleep, we presented our strategy with energy and enthusiasm, but unfortunately did not win our division, leaving us out of contention for the finals. Despite the disappointing results on paper, QUT was anything but disappointed with our efforts and our presentation. Throughout the week, we improved as a team and individually, and presented strong strategies for each case. Despite not making the finals, we were privileged to watch the finalist presentations, which provided new perspectives on how to approach and deliver a case strategy. 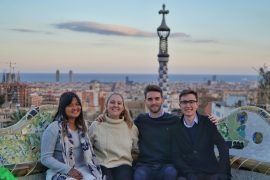 The well-deserved winners of the competition were Copenhagen Business School, with Hong Kong University of Science and Technology in second place and the University of Southern California in third place. 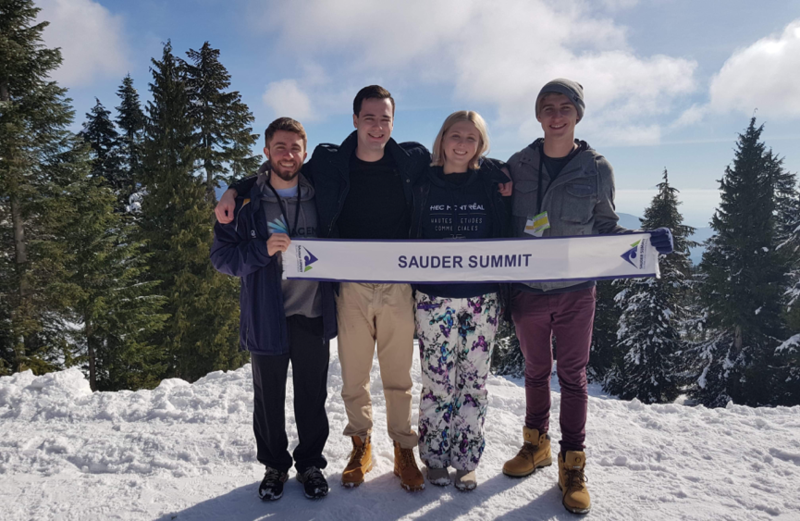 Sauder Summit was an exciting and enriching experience for everyone involved. 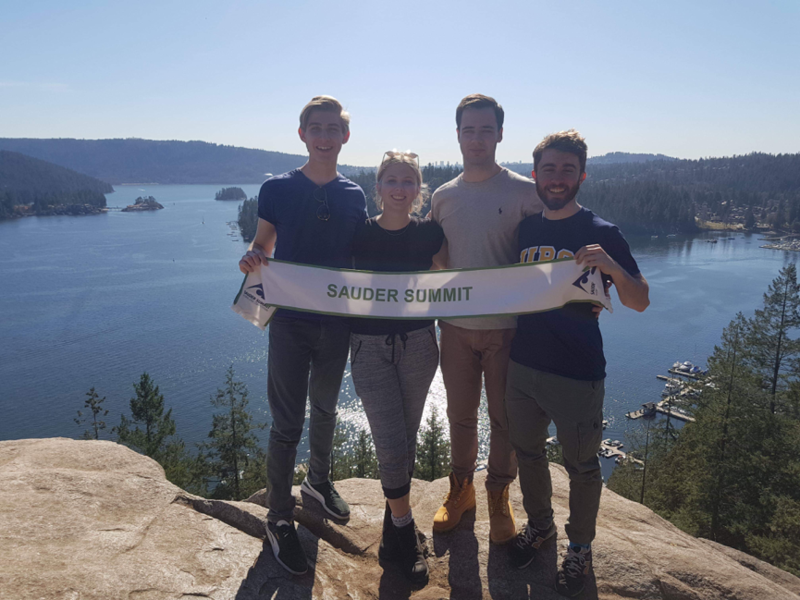 Heath, Michael, Cameron and I all enjoyed exploring Vancouver, meeting locals and other competitors alike, and learning from the diverse perspectives of all of the interesting people who were a part of Sauder Summit 2019. The team is extremely grateful for our fantastic advisor, Ingrid Larkin, who coached and supported us in the lead up to the competition and provided constructive criticism, positive reinforcement, and a lot of laughs throughout the week. 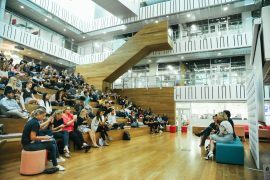 For anyone wanting to get more involved at QUT, the case competition team is the perfect opportunity to learn outside of the classroom, put your skills to work in real-world scenarios, meet new people and experience new places. I couldn’t be more grateful to the QUT Business School for providing the opportunity.